A talk with Jocelyn for Sacred Planet, “Edge Thoughts,” September 20th, 2018 for October 23rd, 2018. To download and read the full paper, please click HERE. From earliest times bees have been approached with reverence and awe, and used for religious and magical purposes. Bees are the great pollinators. Honey was the earliest sweetener and a fermented drink could be made from it – mead. Honey, like water, was seen as a “giver of life” and necessary to existence. “Honey hunting or gathering” can be seen in rock paintings in Spain and south-west France going back 15,000 years or more. 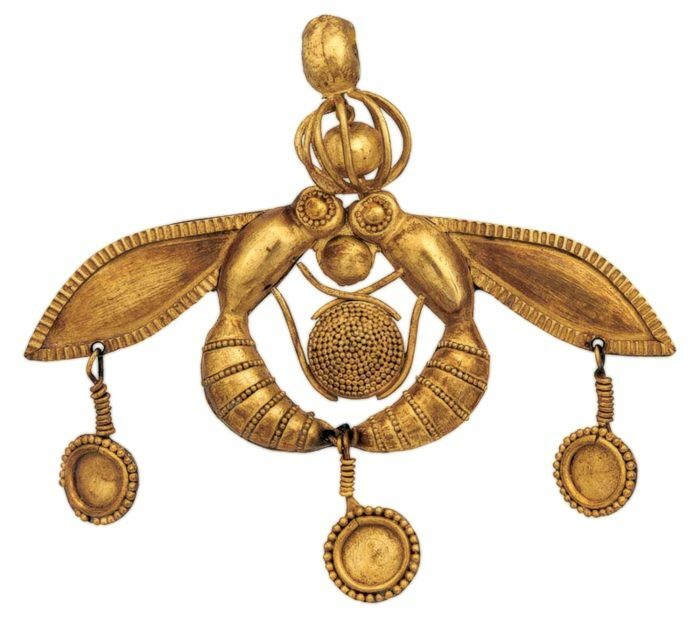 Bees were mysterious and associated with birth, death, and reincarnation in folktales and myths from many different cultures around the world. They are associated with the Great Mother Goddess and with bull worship which was also dedicated to the Great Mother. The ritual of “Telling the bees” stories of their owner’s family has been a long held custom which suggests bees were approached as having supernatural powers and early on were associated with oracular and other ritual traditions. In July 2008, at the IAJS/IAAP Conference in Zurich, several colleagues and I had the distinct pleasure of participating in a reading of Armando Nascimento Rosa’s play, Mary of Magdala: A Gnostic Fable (English translation by Alex Ladd). As I had long been interested in the Gnostic, apocryphal, and legendary traditions surrounding the figure of Mary Magdalene, not least of which was her connection to the Grail myth—and at different times had made pilgrimages to her various sacred sites in France, and even once had a dream about a visit to the beautiful cathedral at Vézelay (south-east of Paris) dedicated to her—it was an additional honor for me to read her part in Rosa’s play. There were other connections with Mary Magdalene. As a child, one of the most moving stories in the New Testament for me was the one where, in St. John’s Gospel, she is weeping outside the empty tomb, conversing with the angels about her sorrow, and turns to see Jesus but does not recognize him as he is in a subtle body form, and the text says that she supposes that he is the gardener. Jesus enquires about her weeping, and it is the sound of his voice calling her name that identifies him to her. Without having the words for the experience then, it was the feeling of a deep pathos and of a love bond between Jesus and MM that had had a stirring impact on me. Then, much later, I had a dream that created one of those major turning points in life. In the dream, I was discovering a hidden text beneath the text of St. John’s Gospel. This dream led me to pursue doctoral studies and I now believe that the ‘hidden text’ was this story of the centrality of Mary Magdalene not only in Jesus’ life and her position as “the apostle to the apostles,” but also her significance as an initiate in the high feminine mysteries, and her devotion to the visionary imagination, what theologian Jean Yves Leloup describes as the task of the 21st century. There can be no doubt that the figure of Mary Magdalene as well as the renowned Black Madonnas in the West and the Taras of Buddhism in the East point to an archetypal presence constellated in our time. This presence involves not only images of heretofore neglected aspects of the archetype of the feminine, but also deep emotional feelings and numinous spiritual aspirations related profoundly to our sense of vocation—why are we here? what is being called forth from each one of us?—and our longing for a renewed and integrated sacred sexuality. We are at a point of course correction on our planet. In addition to economic collapse and environmental degradation—signs of the failing nature of a patriarchal myth too long ruptured from the ancient springs of the soul—there are emergent signatures of renewal attempting to be born amongst us. These signatures, once made conscious through reflection, aim for union: soul and spirit with body, the often divergent streams of science and spirituality into a more complete whole, the inclusion of intuition and imagination as equally important ways of knowing as our rational and intellectual modes of apprehending ourselves and the world, and the desire for a truly authentic way of being that honors our own way and the deep creative spirit that lives in each one of us. Mary Magdalene in bringing shadow and spirit, soul and body together provides a symbol of these unions. If you wish to read the rest of the paper, CLICK HERE to download the pdf. a pilgrim’s relationship with the Earth, with the landscape, can be a love relationship. Just like us, the Earth longs for such love and calls us to love her. The Earth in her love for us helps us towards illumination, and we can help her towards hers. That is the hidden purpose of pilgrimage – the so-called redemption of mankind and Nature, the raising of all to light, wherein Light is the manifestation of Love. When we touch the Earth mindfully every step will bring peace and joy to the world. Edgar Mitchell, Apollo 14 Astronaut and IONS founder. Dear Reader, Walking the Songlines of the Soul, is a companion to my previous book, Songlines of the Soul: Pathways to a New Vision for a New Century. In that Songlines, I wrote about the breakthrough of the imaginal world – or Other world as I sometimes call it – into this world in experiences of synchronicity, UFO phenomena, Crop Circles, Near-Death experiences, and the Mystical Cities of the Soul. The focus of these direct encounters of a subtle world in this world happens with the opening of the heart, rather than the interpretations of the mind. Despairing about the prospect of yet another war (this time in Syria) and lamenting the continued disregard of environmental concerns in the collective, not to mention a feeling of overwhelm and helplessness about these large issues, I felt I had to undertake something on a smaller and more human scale, something that I could actually do. So living at the foot of Mt. Ste. Victoire near Aix-en-Provence during the summer of 2013, and hiking almost every day on this sacred mountain, I made plans to walk part of the El Camino de Santiago, not in Spain, but in France, called there Le Chemin de Saint Jacques: I would start from Le-Puy-en-Velay in the Haute Loire to Conques, a mediaeval village in the Auvergne, a journey of some 230 kilometers (or approximately 140 miles). In the autumn of 2015, I walked the second part of the Le Puy route (as it’s called), from Conques to St. Jean-Pied-de-Port, some 550 kilometers (or 330 miles). This book is a story of how, in unexpected and unanticipated ways, imaginal experiences with the spirit and spirits of nature during my walks helped to transform my grief into what I can only describe as a deepening of love both for our Earth, and from the planet toward me. These chance encounters that opened me in subtle ways to other dimensions then led me to the next phase of my life, as if a resonant field of songlines or dreaming-tracks was orchestrating the invisible threads of fate. The encounters also reminded me of the first time I had had an experience of the ‘light of nature’ which was also a felt expression or manifestation of love. I was somewhere between the ages of four and six, and it took place in our vicarage garden in Sussex in my native England one summer evening. To read the complete chapter, please CLICK HERE to download the pdf.